The thing about a long motorcycle journey, okay any long journey, is usually the “long” part. Like you, I’ve got stuff that needs tending. I’ve got a yard that won’t cooperate, dogs that need attention so they don’t start destroying things as my punishment for being gone and, of course, family and friends at home whom I actually enjoying being around. I love being on the road. When I get back from a long trip, I’m usually ready to roll again in a day or two. And that happens a lot in my life, too. Dee and I are travelers; we always have somewhere to go next. 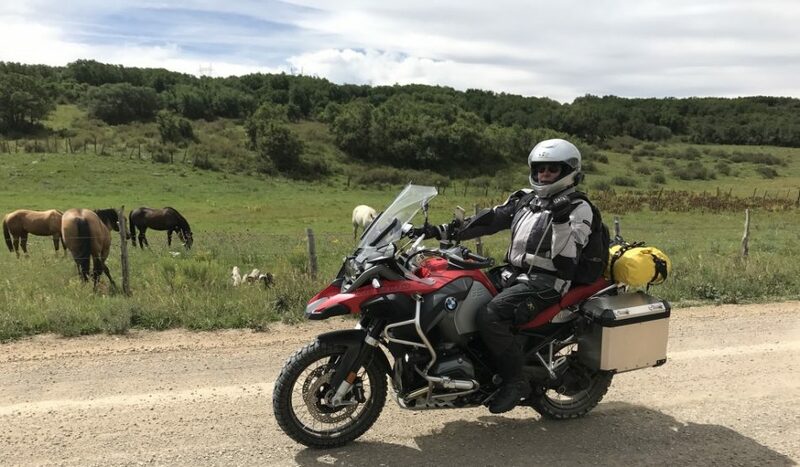 I had been dreaming of doing another cross-country ride for some time. There’s just so much to see in North America — and I want to see it all. There’s that FOMO again. In 2010, I did a triangular roundtrip, LA to Florida to Washington DC and back. It was a defining moment in my life and I still think about it all the time. That trip took 30 days – and even then I was pushing hard to fit it in with my other obligations back home. How could I do a “big trip” again, but break it up into pieces to fit my life? I read an article in a motorcycle magazine about a travel concept called “Chaptering” — breaking up a trip into pieces, or “chapters.” Here’s the idea using a motorcycle: Ride from Point A to Point B, arrange to store the bike at Point B, fly home, and after some, or even a lot of time, has passed, fly back to Point B and resume riding to Point C. Then “rinse and repeat” this process until Point D, Point E or Point Whatever have been accomplished. It could be done as a roundtrip, or have the bike shipped back from the final Point. Yahtzee! This looked like it could work! I get to travel far and wide and the dogs don’t rip up the garden. Like last summer’s ride, Dee will be joining me on this adventure and we set about making plans for what we’re calling the “Epic Chaptering Ride 2016.” The ride will be comprised of four chapters, one per month over four months, June through September, with each chapter lasting between 12 to 14 days, and ultimately covering over 8,000 miles by the time we reach the end of Point D. The majority of travel will be on backroads, versus main highways, and have been selected for scenery, family and friend visits, road trip oddities and general motorcycling fun. We’re departing from home Thursday, June 2 and expect to complete Chapter One on June 12 with a flight home from Seattle.The other three chapters are still being planned out, but we have the general destinations in mind. We’ll ship the bike back from either Maine or New Hampshire (open to suggestions) and fly home sometime around the end of September. We’d love to get your advice on must-sees, must-eats, say-hi-tos and avoid-at-all-costs. I’m planning to post a couple of times on each chapter as it unfolds and, as always, we love hearing from you on Facebook, Instagram, Twitter and texts while we’re on he road. What, you came to Florida in 2010!? Come back! You and Dee are always welcome! The GTL doesn’t fit in a photo. Alright! I’ve put everything on my calendar and will hold you to it!